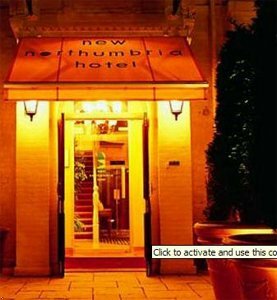 Situated in the Cafe Society of Jesmond, less than one mile from Newcastle City Centre and within walking distance of the city's nightlife, The New Northumbria Hotel is the ideal location for both business and pleasure. Whether a quiet holiday break, a business stop-over, a private celebration or a conference, the staff at The New Northumbria will ensure that your clients and guests enjoy a seamless personal service. All en-suite bedrooms are superbly furnished, each one equipped with TV, mini-bar, tea and coffee making facilities, hair dryer, ironing centre, direct dial telephone, computer connection and much, much more. From the south A1 turn off following signs for Gateshead, A161, after the tyne bridge turn off at the right hand junction towards Coast Road tynemouth A1058. First left into Osbourne Road B1600. From the North turn left off A1 Gosforth wideopen exit, you are then on the B1318 Great North Road, continue down Gosforth High Street. Take a left at the Blue House Roundabout then first right on to Osbourne Road. English breakfast served between 07.00 and 10.00am. Louis' provides a fine ambience in which to enjoy tempting creations from an original and extraordinary menu. A wonderful selection of freshly prepared dishes accompanied by exquisite light souffle dessert. Open Monday to Friday : 12 noon - last sitting 2:30 pm, Monday to Saturday : 6:30 pm - last sitting 10:30 pm Sunday : open all day from 12 noon - last sitting 10:15 pm Scalini's Mediterranean style restaurant is the most popular venue in Newcastle and booking in advance is highly recommended. Open all day from 12 noon, offering Happy Hour priced pizza and pasta dishes, kids menus, business lunches, Sunday lunches, evening Chefs specials and bespoke party menus.